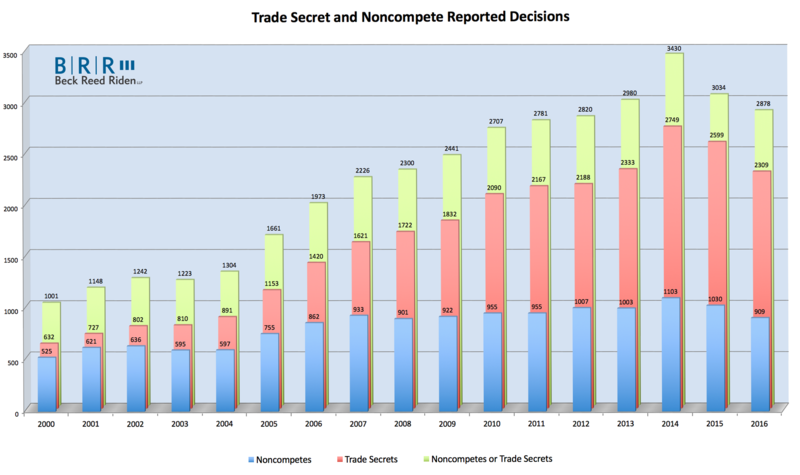 As regular readers of this blog know, several years ago, I became curious to see how many reported trade secret / noncompete decisions were issued each year in all federal and state courts around the country. So, I did a “back of the envelope” calculation. I have performed similar calculations every year since. The graph shows three things: (1) the blue bars show all reported noncompete decisions; (2) the red bars show all reported trade secrets decisions; and (3) the yellow bars show all decisions involving noncompetes or trade secrets or both. I should note that each time I’ve run the queries, the results for each year have varied slightly (inching up over time), which I attribute to Westlaw’s addition of cases over time. Consistent with that, the older the data, the less it moves. Indeed, the oldest data didn’t change at all. The other thing worth noting is that every time I’ve run this inquiry at the beginning of the year (as is the case this time), the most recent year has been way underreported. I suspect that it has something to do with how Westlaw updates its database. I will very likely run my search again later in the year, and, if history is any predictor, the 2015 and 2016 numbers will be significantly higher. We will see! Perhaps most telling is that while noncompete litigation has been relatively static, trade secrets litigation has increased every year, with the sole exception of (preliminarily) 2015 and 2016 – though that result will likely turn out to be an artifact of the Westlaw database issue. In fact, last year, there was a slight dip in the number of cases in 2012; however, after updating the numbers this year, the dip disappeared. If you’d like to take a closer look at the numbers, you can click the image above or here.